I’ll admit that I’m a bit of health nut. Although, I do indulge on goodies from time to time—don’t get me wrong. 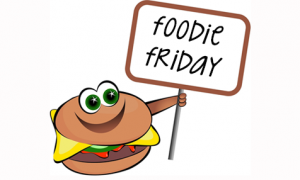 But I recently found a recipe that is the best of both worlds: healthy and tasty! 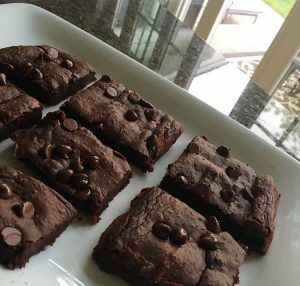 When I first made these brownies, my family turned their noses up at them, especially when they found out what was in them. But then, my daughter eventually tried one and… long story short, she now requests I make these on a regular basis. Ha! So there. Score one for healthy!! Preheat oven to 350°F. Line an 8-by-8-inch baking pan with parchment paper, with ends overhanging the sides. Spray lightly with cooking spray. Melt chocolate and butter together in microwave for a minute, stir, then repeat heating in short intervals until smooth. Meanwhile, in a food processor, puree black beans, sweet potato, egg, syrup, vanilla, baking powder, and salt. Add chocolate mixture and process until smooth. Pour batter into pan, sprinkle tops with extra chips, and bake until brownies set in the center and pull away from the edges, 40 to 45 minutes. Cool completely before using the parchment paper to remove brownies from the pan. 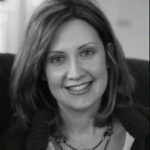 What is Jennifer currently reading? 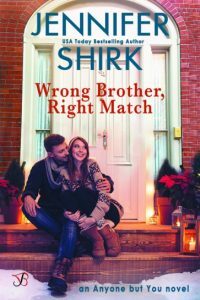 Pick up Jennifer Shirk’s Wrong Brother, Right Match for just 99¢!